Chong Samaesan Temple is raffling off a 500,000-baht Chinese-made MG 3 to raise money for a Brahma statue and shrine. 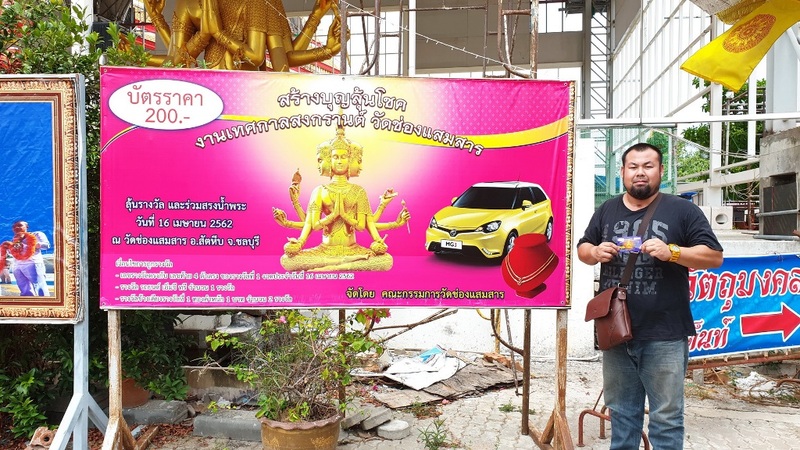 Chong Samaesan Temple is raffling off a 500,000-baht Chinese-made car to raise money for a Brahma statue and shrine. Tickets for the Songkran raffle, described by the temple as a way to make merit, are selling for 200 baht each through April 16, the date of the government lottery drawing. Raffle tickets with the same winning four numbers as the official lottery will win the MG 3, the former Morris Garages brand purchased by Nanjing Automobile Group in 2008. The MG nameplate debuted in Thailand four years ago and the subcompact has a manufacturer suggested retail starting price of 518,000 baht. Consolation prizes are two 1-baht-weight gold pieces. Temple officials said half of the tickets already have been sold.